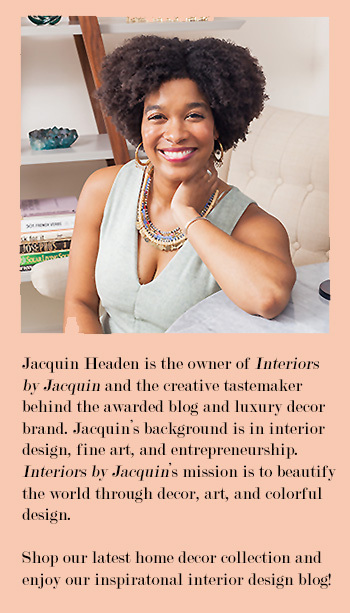 Jacquin: Tell us about your studio space. 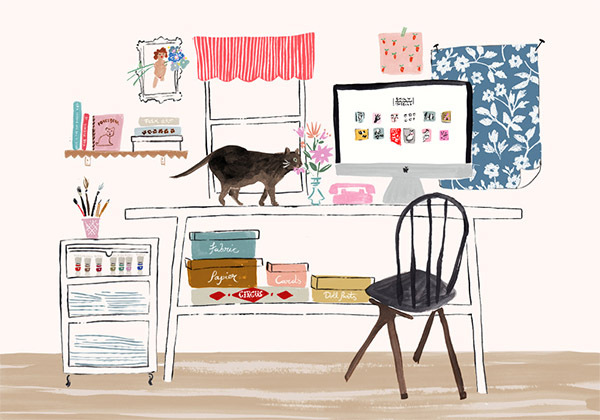 What is your favorite thing about your work space? Emily: Right now, I live in a 250 square foot cottage in the woods. My studio table takes up about half the space! My window looks into the woods and everyday a family of deer walks by. I always take a break from my work to watch my daily visitors. My husband and I are in the process of building a larger studio to work out of. 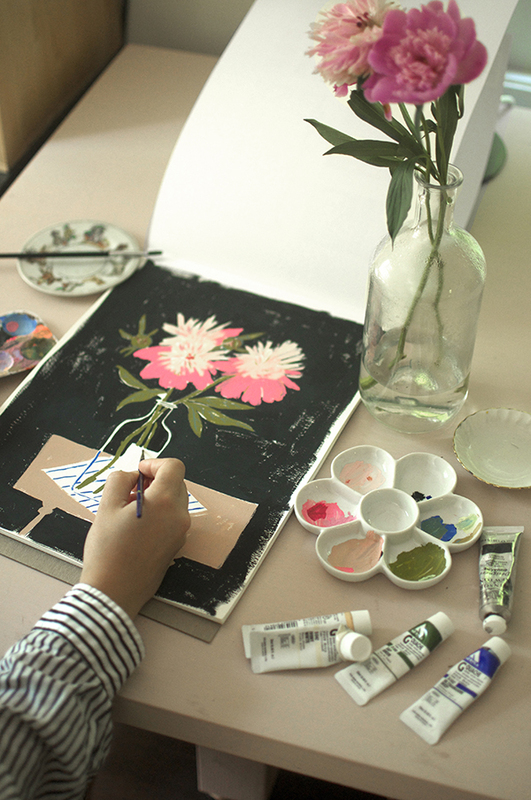 Right now, I use a lot of small brushes and enjoy painting at a very small scale. I have a feeling that my work is going to get a lot bigger when my space grows! Jacquin: What is a typical day in your studio like? Emily: I wake up, make a carafe of coffee and check my email. 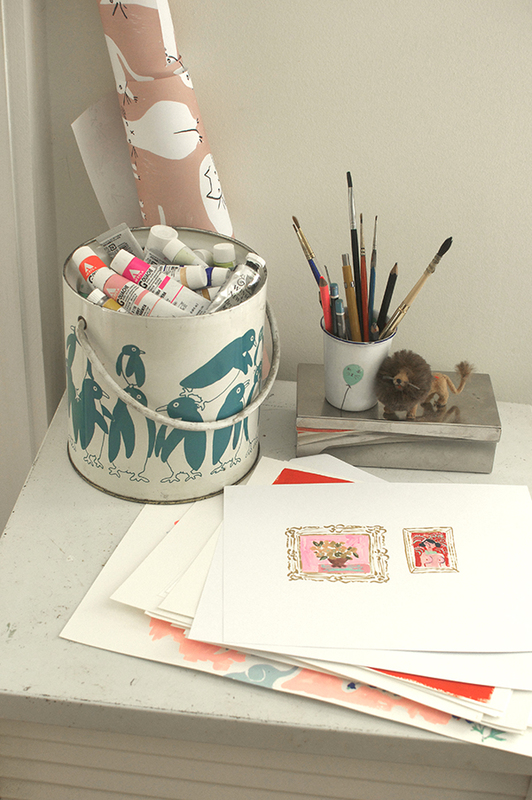 After I’m done with correspondence, I usually take an hour or two to work on a personal project. It’s important to me to balance client work and work I do for myself. I tackle client work for the rest of the day with short breaks throughout the day for a picnic lunch outside or maybe a short walk in the woods. Jacquin: Describe your dream client. Emily: I love a client who trusts my vision and allows me to be authentic. My best work happens when I’m given freedom and time to work from an honest perspective. Jacquin: Where do you see your amazingly creative business in 5 years? 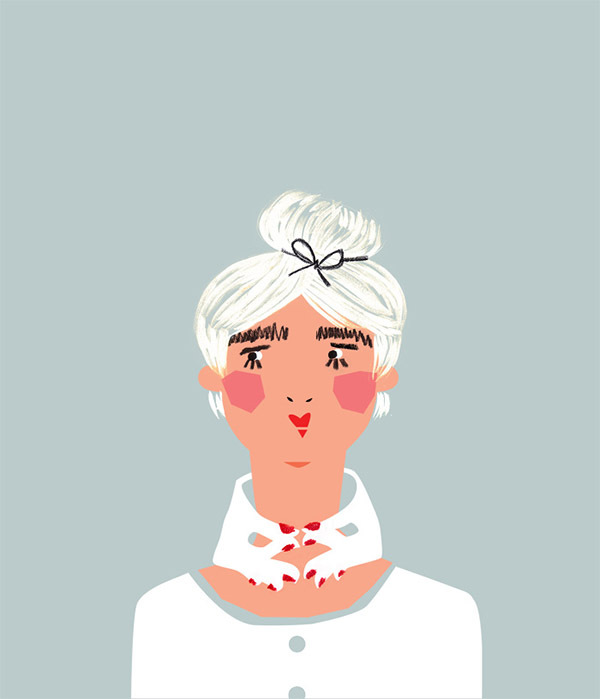 Emily: I’m always looking for new ways to apply my illustrations and textile designs. I’d love to design large scale patterns for upholstery and interior fabrics. 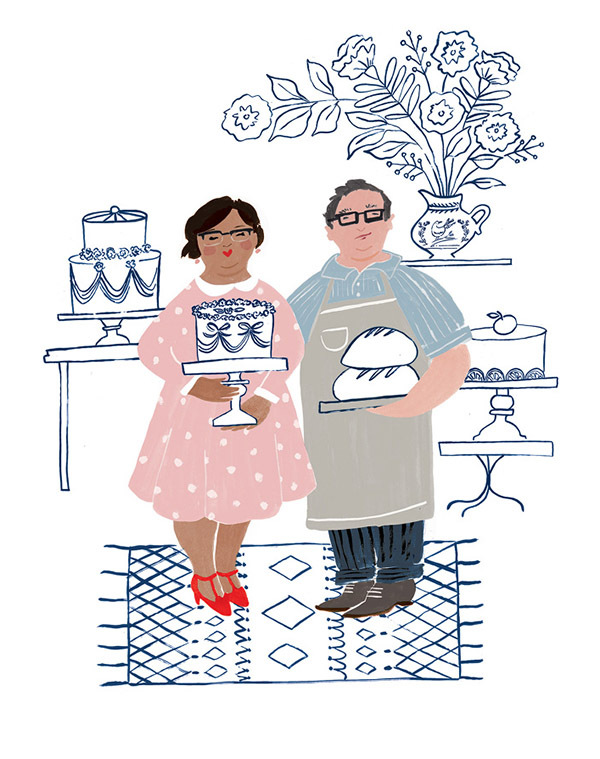 I’d also love to illustrate picture books, design home goods, work on props for movie sets, I want to do it all! It’s exciting to think about all that’s possible in the future. Jacquin: I know you recently took a trip to Provence. How wonderful! How were you inspired creatively during your time in France recently? Emily: My day to day can be pretty busy and I have to make a conscious effort to take breaks. It was so nice to not have an agenda and spend the day filling my sketchbook with inspiration. 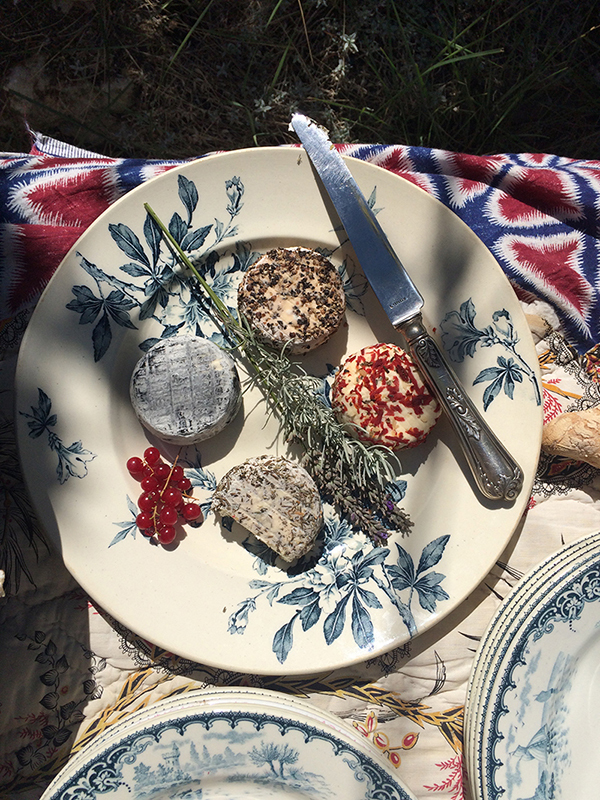 I find it so easy to be inspired in Provence because it’s a place that really speaks to my personality and style. There is inspiration everywhere, from the way a sample of cheeses looks on a plate to the texture of a peeling painted wall in a 13th century church. 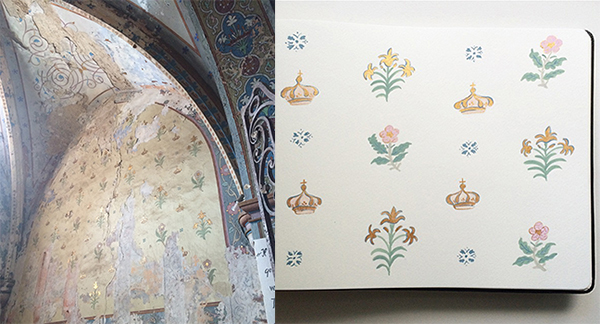 Emily’s 13th century Provencal church inspiration for her illustration on the right. 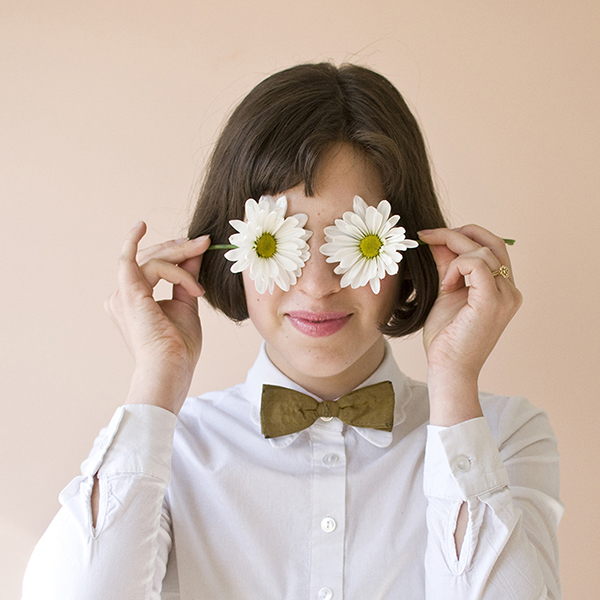 Jacquin: I absolutely love your portraits with flowers! 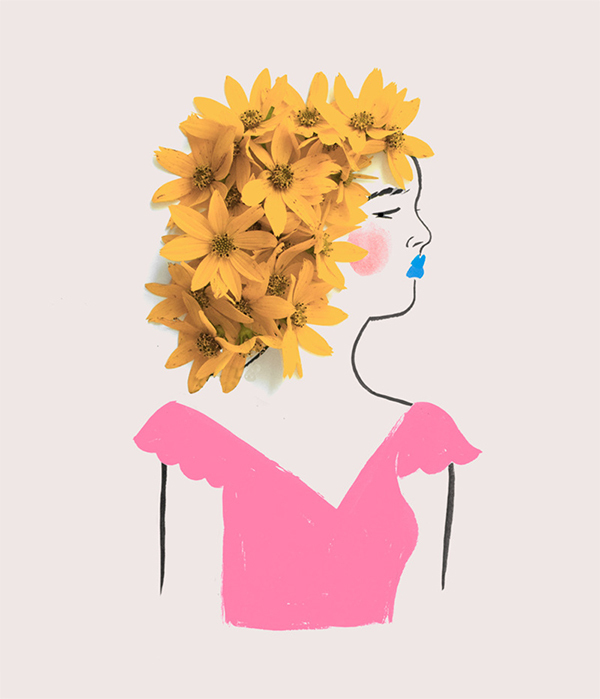 (Flower Ladies) Can you share more about how nature influences your work? Emily: I started illustrating those when I moved to upstate New York and wanted to start memorizing the plant varieties of my new home. I would write a little poetic story about each one that evolved as I researched about each flower. I live in the country, surrounded by nature, so naturally I am influenced by what’s directly around me. Using nature as inspiration is a simple way to create honest work. 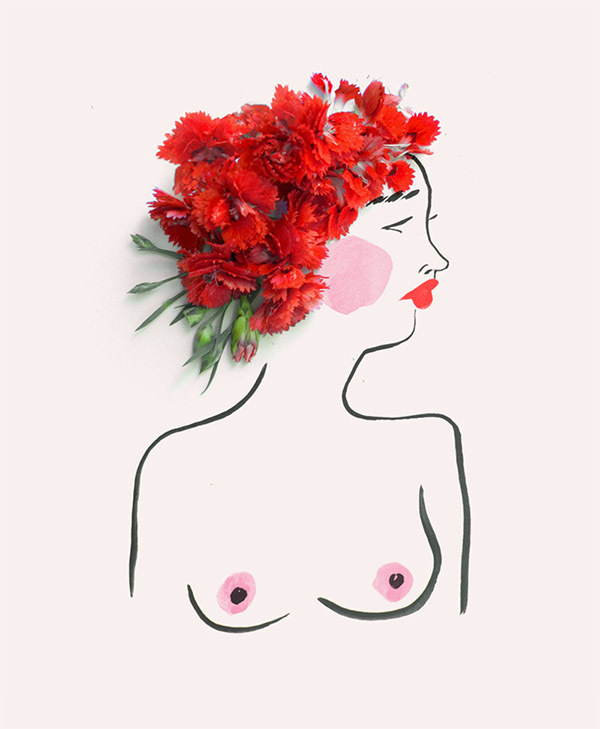 To learn more about Emily Isabella and her whimsical artwork, visit her website here.